THE CHICAGO COLUMBIA CLUB PRESENTS BLACK TULIP‘S GERMAN CHRISTMAS! BLACK TULIP COMMEMORATES 500 YEARS OF THE REFORMATION IN 2017! Black Tulip returns to the Barn with a program focusing on music, art, FOOD, and politics of the Dutch Golden Age, the period in the 17th century when the Low Countries reached the zenith of its economic, political and military power. An open society focused on trade, it fostered development in the areas of painting and philosophy, and had a voracious appetite for good music, both home-grown and foreign. Tulipmania was a period in the Dutch Golden Age during which contract prices for bulbs of the recently introduced tulip reached extraordinarily high levels and then suddenly collapsed. Dedicated to promoting women in classical music for over 140 years, the Musicians Club of Women presents Black Tulip in the beautiful Buchanan Chapel in Fourth Presbyterian Church’s Genevieve and Wayne Gratz Center. Black Tulip‘s Josefien Stoppelenburg, Mirja Lorenz, Phillip W. Serna & Joel Spears performed dramatic cantatas and songs for solo voice and obbligato instruments alongside virtuosic instrumental works for recorders, viols, and theorbo by Alessandro Scarlatti, Tarquinio Merula, Barbara Strozzi, Julie Pinel and George Frideric Handel. Tulipmania looks at the cultural and political events during the peak of Dutch power during the 17th and early 18th centuries. The Dutch protestant north was a bastion of religious tolerance and personal freedom, while the rest of the continent was embroiled in civil wars, and the disastrous 30-Year’s War. The new-found prosperity of this emerging capitalist society encouraged the development of the arts, and provided a large and receptive market for the musical and artistic productions of other countries as well. We’ll play music of native composers as well as foreign composers who were well known is the Low Countries. Tulipmania was a period in the Dutch Golden Age during which contract prices for bulbs of the recently introduced tulip reached extraordinarily high levels and then suddenly collapsed. 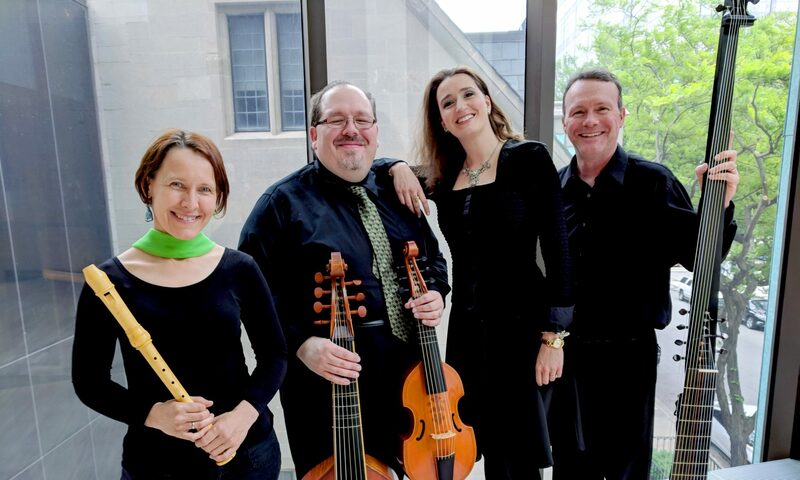 Enjoy a Micro-concert in Evanston as part of One State Together in the Arts as Black Tulip presents Handel’s stirring Pensieri notturni di Filli, HWV 134, performed on period instruments. Hear Black Tulip as they explore rich cantatas for soprano, recorder, and basso continuo. This multinational ensemble of highly acclaimed musicians features Josefien Stoppelenburg, soprano (The Netherlands); Mirja Lorenz, recorder (Germany); Phillip Serna, viol (US), and Joel Spears, theorbo (US). Black Tulip will perform gems by Handel, Telemann, Vivaldi, and Purcell, along with electrifying pieces by Matteis, De Visee and Haquart. BLACK TULIP‘S LE US HOWL! Black Tulip presents ‘Let Us Howl!,’ an exciting and virtuosic program of works by Antonio Vivaldi, Robert Johnson, Robert Jones, Johann Hieronymous Kapsberger, Bartoloméo da Selma y Salaverde, Henry Purcell, Nicola Matteis, Georg Philipp Telemann, Carel Hacquart, and George Frideric Handel!